Planning, as Associate Vice-Principal (University Services) Jim Nicell would be the first to say, is not an exact science. But it certainly can be interesting. Nicell held the attention of more than 150 people during an hour-long lunchtime information session summarizing McGill’s Master Plan for the future. In summarizing the planning and design principles of the Master Plan, Nicell outlined nine broad “themes” governing all University initiatives. These guidelines include, among others, developing and maintaining open spaces; conserving the University’s heritage buildings; and investing in facilities that support excellence in research, teaching and learning. He went on to highlight a host of construction projects both planned and in-progress. Chief among the big-ticket items is the proposed bioengineering building to be built on the Powell site on Dr. Penfield Ave. The 130,000-square-foot facility would serve stakeholders from across the University including the faculties of Medicine, Engineering, Chemistry and Science. Estimated cost: $120 million. “This gives you an idea. Master planning has to be a long-term process,” said Nicell. “I don’t have $120 million. I don’t even have $10 million toward this so far. 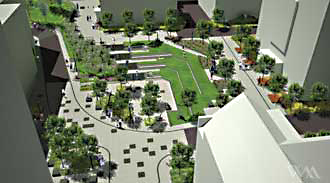 development of open spaces such as the James Square project. “When I entered this job after being here for 15 years, I had no idea just how big this university was,” said Nicell. “Well, we have two campuses, downtown and Macdonald, and we have some growth that is going to occur on the MUHC Glen campus when we have a research institute that is put in place. We have 228 buildings at 780,000 square metres – that’s roughly 8 million square feet. We’re the largest property holders on the entire island of Montreal. Outlining the basic principles of the Physical Master Plan, Nicell reminded audience members that the Plan itself is an “as we go” entity. Nicell stressed the point that most of the financing for these projects comes from external funds specifically earmarked for facility upgrades, including $25 million a year for the next 15 years for deferred maintenance. He also outlined the irony of the government’s Knowledge Infrastructure Program that, has committed $100 million for any number of McGill construction projects – provided they be finished by March 31, 2011 – an incredibly tight time-frame considering the project was announced just a year ago. The speed with which these projects must be finished is “unprecedented in the history of McGill University and probably unprecedented in the history of the construction industry,” said Nicell.